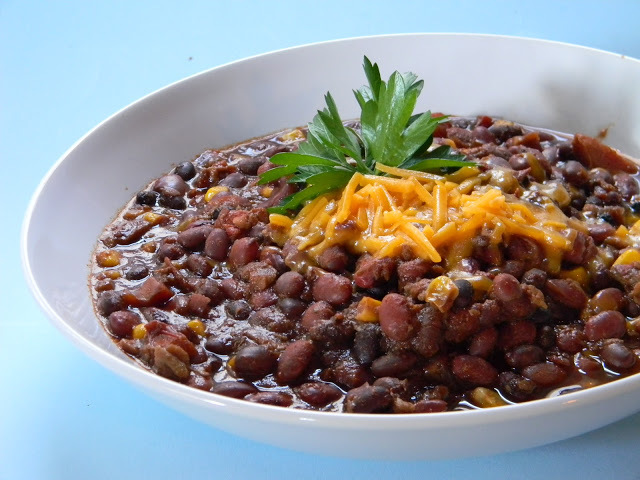 I have come across quite a few varieties of vegetarian chili but to tell you the truth they have not come close to my version. I have made this recipe a lot of times and it never lets me down. In Spain we use legumes quite a bit, on salads, stews, soups, so I have kept that tradition on, easy to do I must add, since legumes are one of the power foods, and very economical. For this version I use something called veggie crumbles or microprotein. It resembles minced beef but it is vegetarian. I normally find it at the organic section at the supermarket. We do not eat it to often, I only use it for the chili. It is natural, although I do not like using imitation meat to often. You decide whether you want to use it or not, but I think it adds up a nice touch. Carefully sort through the beans removing any extraneous material. Rinse well. Put in a pot add 2 quarts of water, and soak overnight. In a heavy pot at medium to high heat add oil, saute onion, peppers, and carrots for about 5 - 7 minutes. Add the garlic and cook for another 2 minutes. Turn heat to low and add spices. Cook for 2 -3 minutes. Add chopped tomatoes and cook for another 3 minutes or so. Add chopped tomatoes, presoaked beans, salt and water. Cover the pot and cook over medium to low heat for about 60 - 90 minutes. Sometimes more depending on the size and maturity of the beans. Keep checking chili every 15 - 20 minutes or so for tenderness of the beans. When beans are tender, add corn and veggy crumbles. 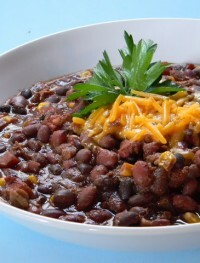 Taste chili and adjust salt and heat to taste. Garnish as desired.